Honestly, can you imagine talking about living with your girlfriend this way? If you have to wonder, you know the answer. I can't work out if it's early morning or late night here? Early morning, since he just shaved? This is one of the OP sequences that really stuck in my brain for some reason (maybe Hanna's line at the end). I feel like Will knows the answer and knows that he knows the answer; that doesn't make it any more desirable to arrive at. 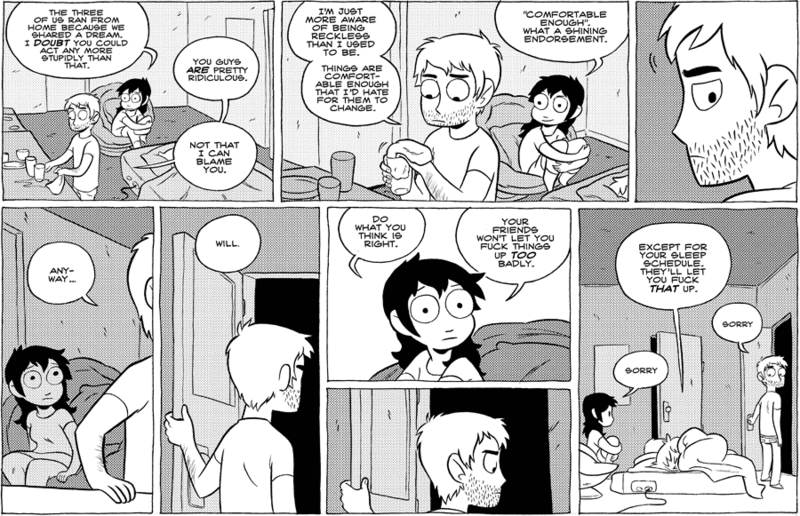 You allude at various later points in the comic to Will having a bad history with relationships, both romantic and familial, and arriving at "comfortable enough" is maybe rare enough for him that it's a scary thing to lose, even if he's already lost it. The extremely confused no idea what he's doing 24 year old buried inside me can! The 38 year old that's on the outside cannot.